Aaron Poochigian’s Mr. Either/Or is the most significant verse novel since at least Vikram Seth’s best-selling The Golden Gate of three decades ago, although Poochigian’s prosody and plotlines are more innovative than Seth’s. A kaleidoscopic fusion of the masterful verse of Richard Wilbur and the hipster wryness of Douglas Adams, this book combines multiple genres, high culture with pop culture, and grimness with exuberance. It is a memorable, challenging and entertaining read. Welcome to Apollo's Dinerette, where high and low alliterate and rhyme. Think of a Gen X Ovid channeling Dashiell Hammett in a hard-boiled Choose-Your-Own-Adventure, without the illusion of choice. Here we find periods Miltonic and Byronic, gleefully seething with cartoon villainy, pratfalls, B-movie clichés, and vivid brutality. Mr. Either/Or is a pop art symphony — sprezzatura on the tongue, melisma in the mind — and a Zoroastrian epic of kitsch and contradiction, aware that "tension alone can keep the world in balance." Also, it's funny as hell. The bro-tastic Keanu of a protagonist may face many choices in these pages, but for you, there can be only one. Don't choose poorly — read it! Mr Either/Or is like nothing else you will have read. You have to imagine Raymond Chandler, Edgar Rice Burroughs, H. P. Lovecraft, the script-writers of The Sopranos, Robert Browning and the author of Beowulf all being miraculously melded into one supremely talented writer, with a gift for rhyme, for metrical verse and for extravagant but spot-on metaphors. The story is entertaining, fast-moving and delightfully over-the-top. We move from mysterious Eastern legends of “The Dragon’s Claw” (shades of Modesty Blaise?) to espionage-fiction with shades of gritty hardboiled, and finally to an imaginative parody of apocalyptic science-fiction. It all takes place in contemporary New York, which is described with a loving but acutely sardonic eye, from the gingko trees of Washington Square to Trump’s Palace poking “its crenellated top / over boutiques and consulates,” from the “slick / avenues of primordial goo” of the sewer system (complete with army of subterranean “troglodytes with dirt/ for skin, sporadic teeth and vermin eyes”), to the halls and galleries of the Metropolitan Museum, all culminating in a surreal grand finale with lizard-like invaders assaulting the mast on the roof of the New York Times Building. Poochigian alternates action-scenes in superbly handled alliterative verse in Anglo-Saxon style (scenes of gang-warfare, of fights with aliens, chases through the subway, through the galleries of the Met and across Manhattan by car) with deft narrative and dialogue in rhyming iambic pentameter. There is no other voice quite like this in contemporary fiction or contemporary poetry: ranging from coolly colloquial to wittily literate and, when called-for, straightforwardly thrilling. Poochigian is enjoying himself. Read this book and you will enjoy yourself too. That’s a guarantee. AARON POOCHIGIAN earned a PhD in Classics from the University of Minnesota and an MFA in Poetry from Columbia University. His book of translations from Sappho, Stung With Love, was published by Penguin Classics in 2009, and his translation of Apollonius’ Jason and the Argonauts was released October 2014. For his work in translation he was awarded a 2010-2011 Grant by the National Endowment for the Arts. His first book of original poetry, The Cosmic Purr (Able Muse Press), was published in 2012 and, winner of the 2016 Able Muse Poetry Prize, his second book Manhattanite will be out in the Fall of 2017. 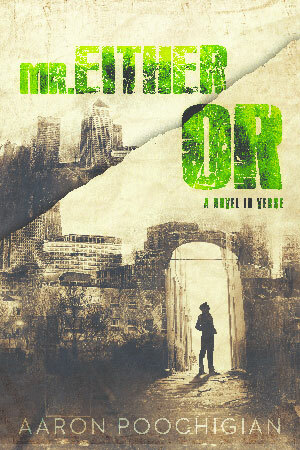 His thriller in verse, Mr. Either/Or, will be released by Etruscan Press in Fall of 2017. His work has appeared in such journals as The Guardian, POETRY and The Times Literary Supplement.